This page is under construction, and is updated, on occasion, when new information is found. CF25A VE3XN 1990-02-15 1990-04-15 25th anniversary of the Canadian Flag. CF1 VE1 1978-07-25 1978-10-29 Unknown event. 25th anniversary of the Canadian Flag. 50th anniversary of the end of the Holocaust. CF2 VA2 2001-06-15 2001-07-15 50th the anniversary of the founding of "Radioamateurs du Quebec, Inc."
CF3A VE3AT 2015-10-13 2015-11-21 100th Anniversary 2nd Battle of Ypres and In Flanders Fields. CG1 VE1 1996-10-26 1996-12-29 80th Anniversary of the Canadian Broadcasting Corporation (CBC). CG1B VE1 1994-03-24 1994-04-01 Cape Breton Island, NA-010 RSGB IOTA. CG[1-9] VE[1-9] 2006-12-01 2007-01-31 Centenary of first AM radio broadcast from Canada on 1906-12-24. CG2 VA2 2001-06-15 2001-07-15 50th the anniversary of the founding of "Radioamateurs du Quebec, Inc."
CH1 VE1 1975-01-01 1975-12-31 Centenary of Truro, Nova Scotia. CH VO 2006-12-01 2007-01-31 Centenary of first AM radio broadcast from Canada on 1906-12-24. CH8 VE8 1996-10-26 1996-12-29 80th Anniversary of the Canadian Broadcasting Corporation (CBC). CI VY 2006-12-31 2007-12-31 Centenary of first AM radio broadcast from Canada on 1906-12-24. CI VY 2017-01-01 2017-12-31 150th anniversary of Canada's Confederation, which took place on July 1 1867,. CI VE 1996-10-26 1996-12-29 80th Anniversary of the Canadian Broadcasting Corporation (CBC). CI3 VA3 1997-07-12 1997-09-15 Centenary of the Victorian Order of Nurses in Canada. CJ1 VY1 1984-09-09 1984-09-20 Visit of Pope John Paul II. CJ VO 1998-12-01 1998-12-31 75th anniversary of the first two-way trans-Atlantic QSO. CJ3 VA3 1996-10-26 1996-12-29 80th Anniversary of the Canadian Broadcasting Corporation (CBC). CK1 VE1 1994-10-01 1994-10-31 210th anniversary of the proclamation of the Colony of Cape Breton Island. CK VY 1996-01-01 1996-02-29 50th anniversary of the end of the Holocaust. CK VY 1998-12-01 1998-12-31 75th anniversary of the first two-way trans-Atlantic QSO. CK VY 1996-06-08 1996-08-08 100th Anniversary of the Yukon Gold Discovery. CK5 VY1 1996-10-26 1996-12-29 80th Anniversary of the Canadian Broadcasting Corporation (CBC). CZ VY 1990-03-01 1990-04-30 25th anniversary of the Canadian Flag. Montreal. Summer Olympic Games 1976 . CZ4 VO2 1998-06-12 1998-08-12 100th anniversary of the Imperial penny postage. CZ6 VO2 1996-10-26 1996-12-29 80th Anniversary of the Canadian Broadcasting Corporation (CBC). VA VO 1984-06-20 1984-08-20 450th anniversary of Jacques Cartier's landing. VA100U VE3IPR 1991-03-01 1991-04-30 100th anniversary of Ukrainian settlement in Canada. VA6 VE6 1996-10-26 1996-12-29 80th Anniversary of the Canadian Broadcasting Corporation (CBC). VB9 VE9 1996-10-26 1996-12-29 80th Anniversary of the Canadian Broadcasting Corporation (CBC). VC[1-9] VE[1-9] 1998-06-08 1998-08-08 100th Anniversary of the Yukon Gold Discovery. VD1NUQK VO 2019-01-26 2019-02-26 Commemorating the USS Truxton and USS Pollux naval disaster 77 years previously. Ops VO1AX, VO1FOX, VO1JOB. 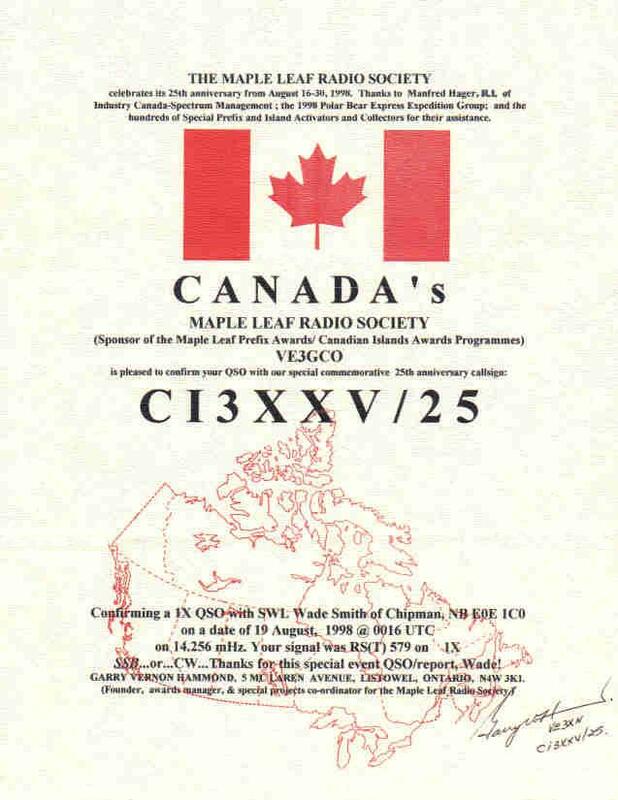 2001-06-15 2001-07-15 50th the anniversary of the founding of "Radioamateurs du Quebec, Inc."
VC2C VE2 2003-10-25 2003-20-27 CQ WW DX phone contest frome zone 2. VX7 VA7 1996-10-26 1996-12-29 80th Anniversary of the Canadian Broadcasting Corporation (CBC). VY[2-8] VE[2-8] 1984-06-20 1984-08-20 450th anniversary of Jacques Cartier's landing. VY VY 1990-09-18 1990-11-05 Unknown event. Industry Canada Regina Communications Club. Dates from Club Log QSO database. Industry Canada Regina Communications Club. CQ WW DX Phone contest..
Industry Canada Regina Communications Club. CQ WW WPX Phone contest. Known calls from CL database: XJ0NEH HMCS 'Iroquois'. 1974/5 (tnx EI7CC), XJ0MAD 1985. XJ1 VO1 2001-12-12 2002-02-13 Centenary of Marcon's first Trans-Atlantic wireless signal on 1901-12-12. XK7 VE7 1996-10-26 1996-12-29 80th Anniversary of the Canadian Broadcasting Corporation (CBC). 1977-08 1977-08 Unknown event Club Log QSO database. XO3 VE3 1975-06-01 1975-10-31 Centenary of North Bay, Ontario. RadCom July 1975. Summer Olympic Games 1976 . 2009-05-27 2009-06-01 Zone 2, QTH unknown, info required. XK1 VY1 1985-06-29 1985-08-30 DXNS #1166. No QSOs in CL database. 2000-01-16? XK1CYL only. From CL QSO database. XK2 VE2 1976-06-01 1976-06-02 XK2JQ only. From CL QSO database. XK2 VO2 1984-09-13 1984-09-18 XK2AB only. From CL QSO database. DXNS #1166. No QSOs in CL database. XK VA 1998-06-01 1998-07-15 125th anniversary of the Royal Canadian Mounted Police (RCMP). XL[1-9] VE[1-9] 1994-05-28 1994-07-28 50th anniversary D-Day. XL2 VA2 1997-07-12 1997-09-15 Centenary of the Victorian Order of Nurses in Canada. XL4 VE4 1996-10-26 1996-12-29 80th Anniversary of the Canadian Broadcasting Corporation (CBC). XM2 VA2 1996-10-26 1996-12-29 80th Anniversary of the Canadian Broadcasting Corporation (CBC). XM5 VE5 1996-10-26 1996-12-29 80th Anniversary of the Canadian Broadcasting Corporation (CBC). XN2 VY2 1996-10-26 1991-12-29 80th Anniversary of the Canadian Broadcasting Corporation (CBC). XN VY 1998-06-01 1998-07-15 125th anniversary of the Royal Canadian Mounted Police (RCMP). XN[1-8] VE[1-8] 1991-10-17 1991-12-31 Unknown, info required. 1981-06 1981-06 Unknown event Club Log QSO database. XO0ICE/2 VE2TKH 2009-04-17 2009-05-31 50th anniversary of the entry into service of the St. Lawrence Seaway. XO1 VY1 1984-10-13 1984-12-13 Centennial of Greenwich Mean Time & standard time signals, whose prinipal advocate was Canadian, Sir Sandford Fleming..
XO VO 1994-05-28 1994-07-28 50th anniversary D-Day. XO3 VO1 1996-10-26 1996-12-29 80th Anniversary of the Canadian Broadcasting Corporation (CBC). XO9TP VO1 1992-09-01 1992-09-15 Rescue of crew and members of US Navy vessels Truxton and Pollox which ran aground off the Burin Peninsular, Newfoundland in February 1942 QST Canada September 1992.